Most of us like bears, they are popular models for cuddly toys, unlike wolves which are mainly feared or foxes that are often deemed to be cunning. 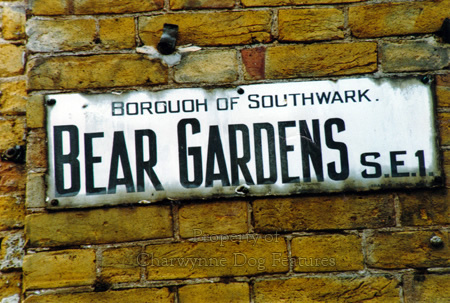 Man's cruelty to bears down the ages, from the medieval hunting field to the evil baiting rings, has been appalling. I hate seeing bears in zoos and get angry when I see them, nose-ringed and declawed, being forced to 'perform' by beggars in countries like Hungary. When I was a soldier in the Malayan Emergency, we inherited a tame honey-bear from a preceding unit; she had been abandoned as a small cub and was saved from starvation by the patrol that found her. She was well looked after and thoroughly spoiled, as the camp mascot. She was charming and without malice. Why has man been so brutal towards bears? And to sacrifice brave dogs in such brutality is doubly shameful. 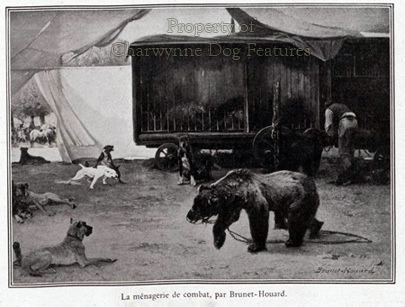 Long after bear-baiting was banned here it was continued in France, with breeds like the Dogue de Bordeaux being 'tried' on bears to test their 'gameness'. 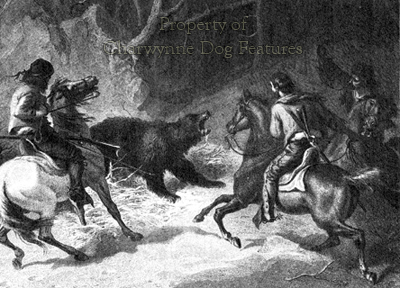 Hunting the slow-moving but hard-to-kill bear brought about a very different form of pursuit. In the medieval hunting field, the mounted noblemen were armed with special lances, supported by the peasantry carrying long 'fending-spears'. It would have taken a long time to kill a bear using such weapons. 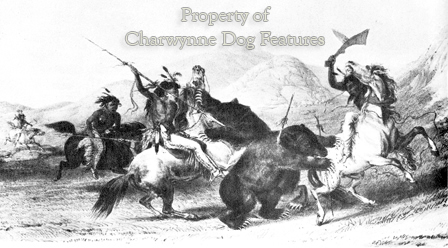 In North America, Indian hunters used lassoes to catch their bear-prey, sparing the spear and knife to allow an uncut skin to be used as clothing or bedding. Today's high-powered rifles give a hunted bear no chance of escape. 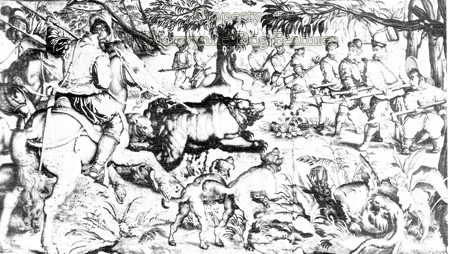 The bear-hunt conducted in Britain by Saxon kings would have been much more dangerous for the hunter and much more savage and cruel for the bears. In the forest laws introduced by Norman kings, bears became 'beasts of venery' - along with hind, hart, hare and wolf and allowed to be hunted only outside a royal forest. 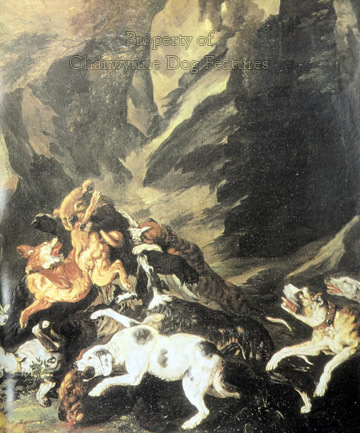 The 'beasts of the chase' were hunted using packs of hounds at pace; the 'beasts of venery' were first located using 'lymmers' or 'limiers', specialist scent hounds rather like the 'tufters' used to find hiding deer in the stag-hunt. In North America the Tahltan bear dog and in Finland the Karelian bear dog have been used to find bears in remote areas and guide the hunters to them by barking incessantly. 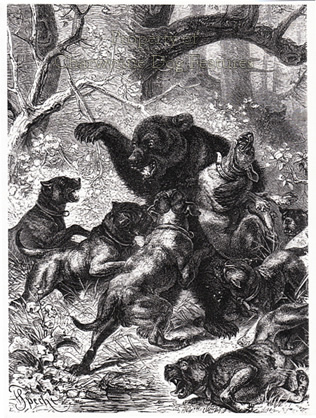 A tree-seeking, slow-moving, heavily-scented bear is often easy to locate but hard to kill, with many dogs sacrificed in a hunt for them, before the rifle came into use, in which the latter were not prized but considered wholly expendable. Hunting bears using modern methods can still be very cruel to the bear, their fur and thick skin protects them from all but the best-aimed and highest-trajectory bullet. 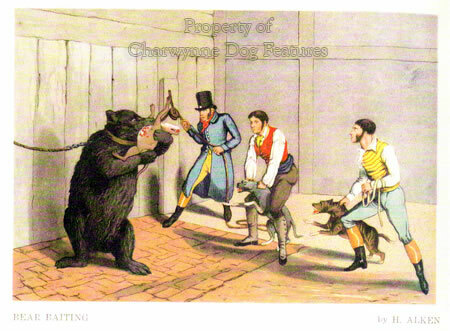 But bear-baiting was conducted to allow the audience to witness, and sadly, to revel in direct and prolonged cruelty to captive animals. It may be wrong to judge it through 21st century eyes but it is surely a form of 'entertainment' that reflects more on those attending it than perhaps any other public spectacle. 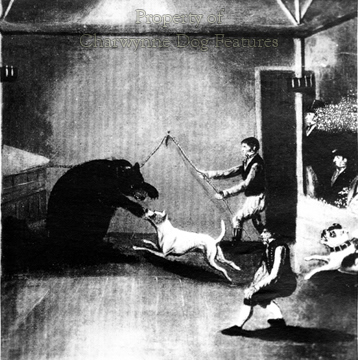 To breed, train and the employ savage dogs to engage in such activities illustrates all too plainly man's gross misuse of dogs; our sympathy for the quarry/ prey/animal targets is always expressed - and quite right too, but our total lack of sympathy for the slaughtered dogs so often accompanies it. Men who indulge in the savage misuse of dogs, from the baiting-rings to the fighting pits, are rarely brave themselves. They come together in groups exercising courage-by-proxy, as the animals display bravery and the humans conceal cowardice. Down the ages, boars, bulls and bears have suffered at our hands; torturing them in the name of sport has never been justified. 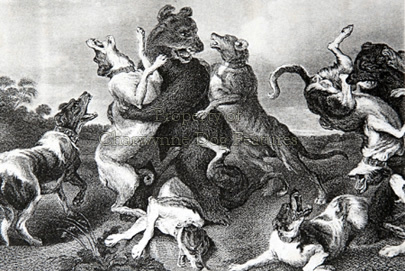 I have some admiration for the reckless courage of the dogs used in the medieval hunt and am loathe to judge our ancestors using contemporary values, but we still have much to do in a number of countries to prevent direct cruelty to helpless bears.